Second, the most common excuse I hear is ‘there aren’t enough people of color in the faculty pipeline.’ It is accurate that there are fewer people of color in some disciplines such as engineering or physics. However, there are great numbers of Ph.D.’s of color in the humanities and education and we still don’t have great diversity on these faculties. When I hear someone say people of color aren’t in the pipeline, I respond with ‘Why don’t you create the pipeline?’ ‘Why don’t you grow your own?’ Since faculty members are resistant to hiring their own graduates, why not team up with several other institutions that are ‘deemed to be of high quality’ and bring in more Ph.D.s of color from those institutions? If you are in a field with few people of color in the pipeline, why are you working so hard to ‘weed’ them out of undergraduate and Ph.D. programs? Why not encourage, mentor, and support more people of color in your field? Third, I have learned that faculty will bend rules, knock down walls, and build bridges to hire those they really want (often white colleagues) but when it comes to hiring faculty of color, they have to ‘play by the rules’ and get angry when any exceptions are made. Let me tell you a secret – exceptions are made for white people constantly in the academy; exceptions are the rule in academe. Fourth, faculty search committees are part of the problem. They are not trained in recruitment, are rarely diverse in makeup, and are often more interested in hiring people just like them rather than expanding the diversity of their department. They reach out to those they know for recommendations and rely on ads in national publications. And, even when they do received a diverse group of applicants, often those applicants ‘aren’t the right fit’ for the institution. What is the ‘right fit’? Someone just like you? Fifth, if majority colleges and universities are truly serious about increasing faculty diversity, why don’t they visit Minority Serving Institutions – institutions with great student and faculty diversity – and ask them how they recruit a diverse faculty. This isn’t hard. The answers are right in front of us. We need the will. For those reading this essay, you might be wondering why faculty diversity is important. Your wondering is yet another reason why we don’t have a more diverse faculty. Having a diverse faculty – in terms of race, ethnicity, gender, sexuality, religion – adds greatly to the experiences of students in the classroom. It challenges them – given that they are likely not to have had diversity in their K-12 classroom teachers – to think differently about who produces knowledge. It also challenges them to move away from a ‘white-centered’ approach to one that is inclusive of many different voices and perspectives. Although I have always thought it vital that our faculty be representative of the nation’s diversity, we are getting to a point in higher education where increasing faculty diversity is an absolute necessity and crucial to the future of our nation. In 2014, for the first time, the nation’s K-12 student population was majority minority. These students are on their way into colleges and universities and we are not prepared for them. Our current faculty lacks expertise in working with students of color and our resistance to diversifying the faculty means that we are not going to be ready any time soon. Rather than getting angry at me for pointing out a problem that most of us are aware of, why don’t you change your ways and do something to diversify your department or institution’s faculty? I bet you don’t, but I sure hope you do. 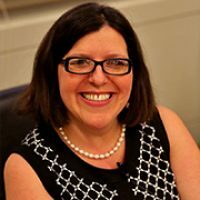 Marybeth Gasman is a professor of higher education in the graduate school of education at the University of Pennsylvania, where she directs the Penn Center for Minority Serving Institutions and holds secondary appointments in History, Africana Studies, and the School of Social Policy and Practice. The question no one can answer about closed colleges: Where do the students go?